Introduction: Roux-en-Y (RNY) gastric bypass surgery is the most common weight loss operation for morbid obesity in USA. Lap-band has gained popularity in the last few years and has become the second most common weight loss operation. 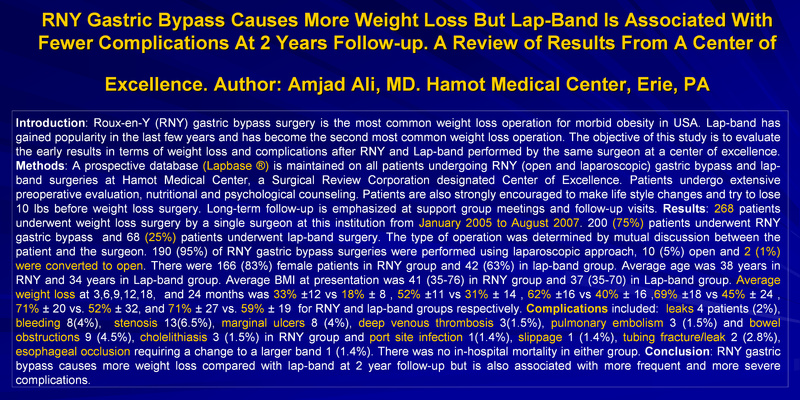 The objective of this study is to evaluate the early results in terms of weight loss and complications after RNY and Lap-band performed by the same surgeon at a center of excellence. Methods: A prospective database (Lapbase ®) is maintained on all patients undergoing RNY (open and laparoscopic) gastric bypass and lap-band surgeries at Hamot Medical Center, a Surgical Review Corporation designated Center of Excellence. Patients undergo extensive preoperative evaluation, nutritional and psychological counseling. Patients are also strongly encouraged to make life style changes and try to lose 10 lbs before weight loss surgery. Long-term follow-up is emphasized at support group meetings and follow-up visits. Results: 268 patients underwent weight loss surgery by a single surgeon at this institution from January 2005 to August 2007. 200 (75%) patients underwent RNY gastric bypass and 68 (25%) patients underwent lap-band surgery. The type of operation was determined by mutual discussion between the patient and the surgeon. 190 (95%) of RNY gastric bypass surgeries were performed using laparoscopic approach, 10 (5%) open and 2 (1%) were converted to open. There were 166 (83%) female patients in RNY group and 42 (63%) in lap-band group. Average age was 38 years in RNY and 34 years in Lap-band group. Average BMI at presentation was 41 (35-76) in RNY group and 37 (35-70) in Lap-band group. Average weight loss at 3,6,9,12,18, and 24 months was 33% ±12 vs 18% ± 8 , 52% ±11 vs 31% ± 14 , 62% ±16 vs 40% ± 16 ,69% ±18 vs 45% ± 24 , 71% ± 20 vs. 52% ± 32, and 71% ± 27 vs. 59% ± 19 for RNY and lap-band groups respectively. Complications included: leaks 4 patients (2%), bleeding 8(4%), stenosis 13(6.5%), marginal ulcers 8 (4%), deep venous thrombosis 3(1.5%), pulmonary embolism 3 (1.5%) and bowel obstructions 9 (4.5%), cholelithiasis 3 (1.5%) in RNY group and port site infection 1(1.4%), slippage 1 (1.4%), tubing fracture/leak 2 (2.8%), esophageal occlusion requiring a change to a larger band 1 (1.4%). There was no in-hospital mortality in either group. Conclusion: RNY gastric bypass causes more weight loss compared with lap-band at 2 year follow-up but is also associated with more frequent and more severe complications.